Drive Your UTV Responsibly During Big Events | Intimidator Inc. Even though many UTV and ATV owners use their vehicles all year long, the end of May marks the beginning of the off-roading season. This time of year is packed with friends and families meeting up at big events or holiday gatherings to have fun, eat great food, and stir up a little dust or mud using their favorite UTV or ATV like Intimidator’s Enforcer ATV. It is also a time when new drivers are getting behind the wheel and new riders are getting their first taste of the trail riding and off-roading lifestyle. Here are some tips for all drivers to know when driving your Intimidator UTV during big events and holidays. Before deciding to load up your Intimidator UTV and other toys, it is a good idea to learn about the places you plan to go off-roading. Are there any restrictions or permits required by the state, county, or land owner? Are parts of the land closed? You may also want to get a map and talk to others to see if there are any areas that are off limits to off-road vehicles. It is also a good idea to look at the weather when planning. If there is a chance for damaging winds and severe weather, then you may want to reschedule. And no matter if you choose to go out or not, telling another person about your plans and routes for the day can be a life-saver. When it comes to playing and riding hard, safety needs to be at the top the list. It only takes a few seconds to go from a fun filled day to a complete disaster. For all the new drivers, taking an off-highway or off-roading vehicle driving course will help you get used to the differences in how your vehicle handles on different types of terrain. Classes like these will also help you learn what to do when sharing land and trails with others and proper trail etiquette such as throwing away any trash in the trash bag you packed and toss it in a nearby dumpster when you return to civilization. In addition to knowing how your UTV or ATV handles on different terrain, it is also very important that you wear the necessary safety gear. For ATVs, wear the proper clothing and a helmet. For UTVs, you need to wear your seatbelt. Once you know how to handle your vehicle and you have on the correct gear, it’s time to ride. Here are a few things to think about when you are out spinning up dust. When you come across a stream or creek, cross at the designated area. If you need to turn around, avoid turning around on narrow trails or steep hills. Simply drive forward or back up until there is a better spot to turn around. There are several tips and tricks to making your day a fun and relaxing day, but the best way is to go out on rides with others who have been riding for years. They can give you great advice and show you what to do and not do to keep you safe. 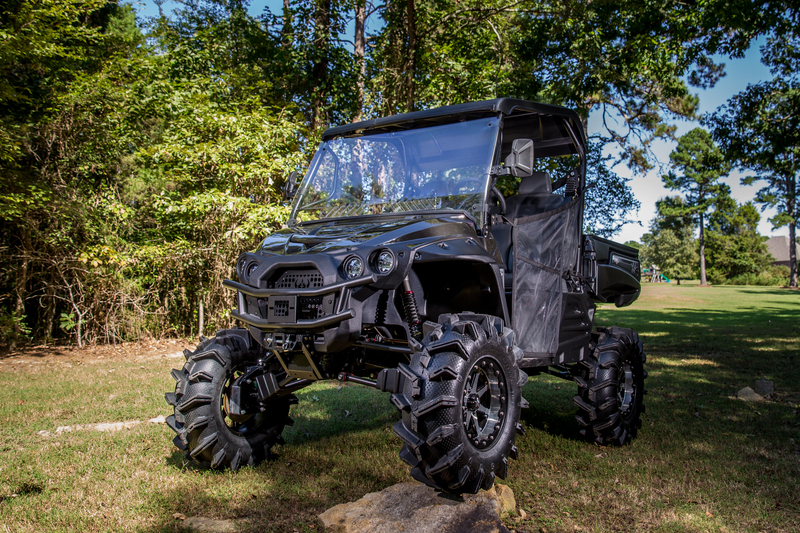 If you are looking for a vehicle that can handle tough terrain and while blazing through the trails at speeds up to 55 mph, then you need to take a look at Intimidator’s Enforcer ATV Series. The Enforcer comes decked out from top to bottom with a 4" Portal Box gear lift straight from the factory, 30% gear reduction, 32" motoboss 6-ply tires, true beadlock MSA wheels, 18" ground clearance, wide track width, and ELKA shocks and power steering! The Intimidator Enforcer is just one of those things that you need to see in person to get the full picture of how amazing it is. You can check it out online at intimidatorutv.com/models/enforcer/ to view all the specs and find a dealer near you. Click on the DEALER LOCATOR, type in your zip code, and plan to visit today so you can begin planning your next Intimidator UTV adventure with family and friends tomorrow.